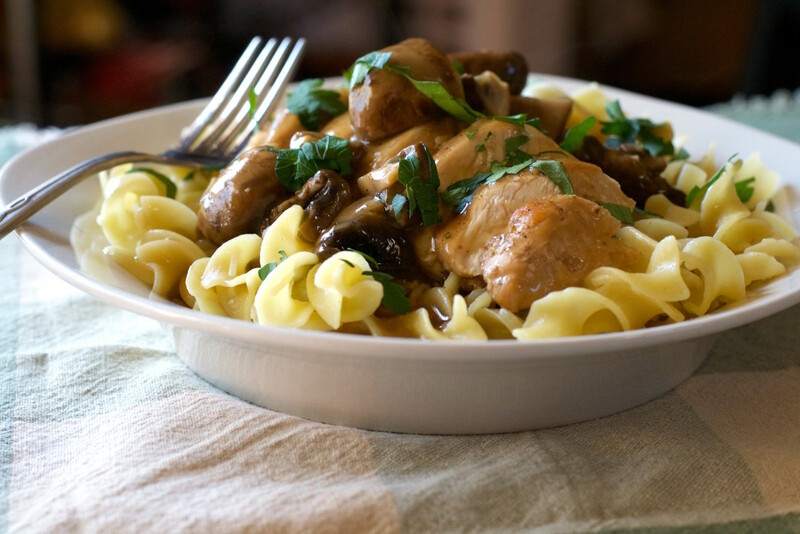 Pressure Cooker Chicken Marsala - What the Forks for Dinner? 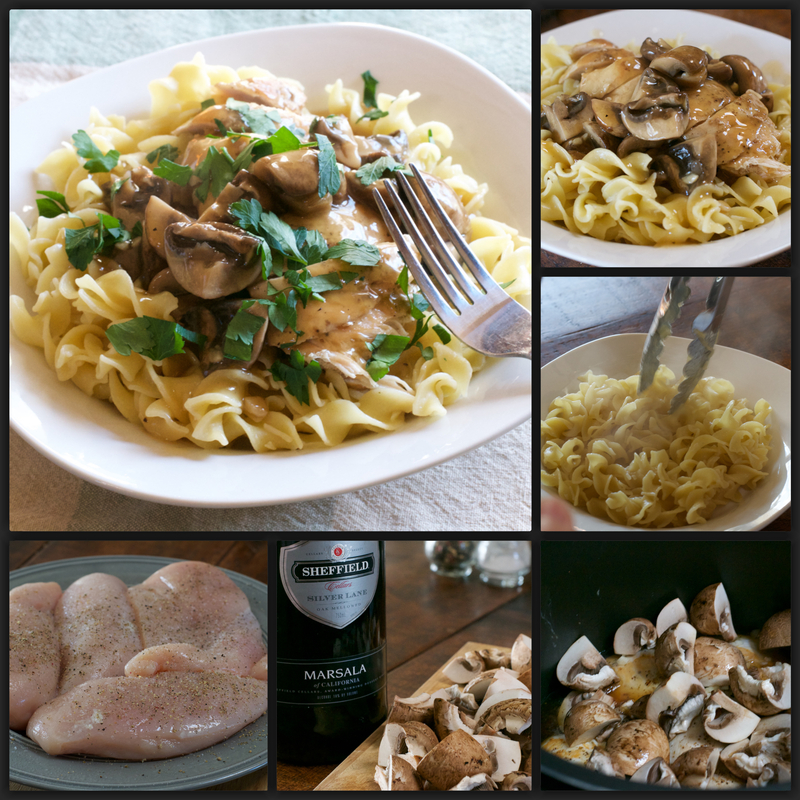 Ok, I’m at it again with the pressure cooker………Pressure Cooker Chicken Marsala. I will continue to sing the praises of the pressure cooker until every home in America has one….from sea to shining sea!! Sorry…… too many political messages lately…..I have lost my mind! But, for a busy family, this is the one kitchen gadget you need. I have made Chicken Marsala from many different recipes over the years, but this one, besides the ease of the pressure cooke,r is the best yet. I think I like it because of the simple ingredients. Nothing fancy, or out of the norm, just fresh chicken……I buy range free…..personal choice, organic mushrooms, and fresh garlic. Marsala wine is Italy’s most famous version of fortified wine, hailing from Italy’s sunny southern region, Marsala is an ancient city on the coast of Sicily. 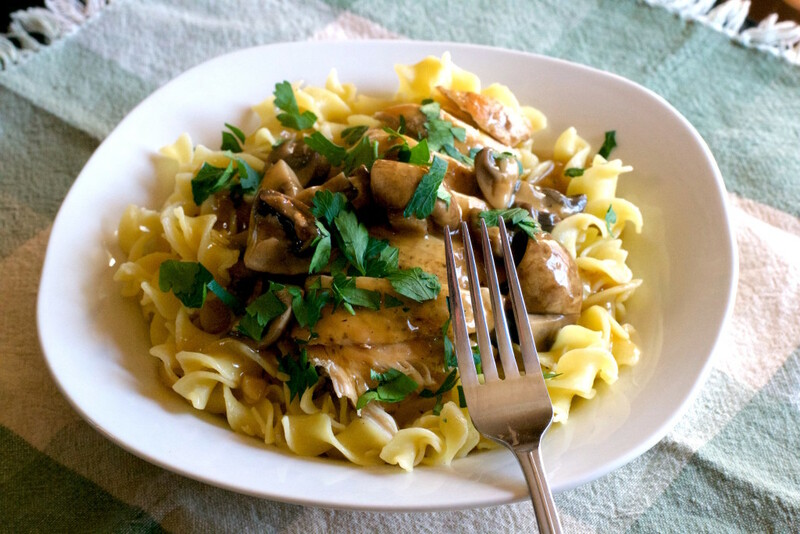 Marsala wine is recognized for its use in various cooking and culinary combinations. Marsala wine can be strong, like a port wine or a sherry, but the alcohol cooks off, so no worries. Only a rich, mellow and earthy taste remains. Part of that earthiness comes from the mushrooms. I prefer baby bella’s, but any mushroom will do. Sear the chicken breast …….no one wants a pale chicken breast. Add the mushrooms, garlic, and Marsala, cover and cook. 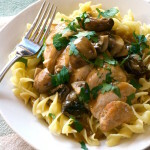 In seven minutes, remove the chicken , thicken the sauce, put the chicken back in for a few minutes to absorb the sauce. I sliced the chicken breast for ease of eating and they look pretty that way. 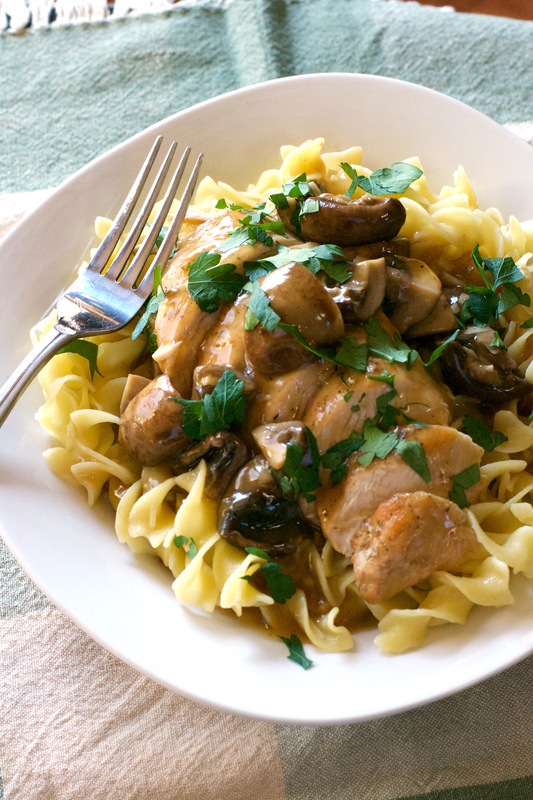 Place the sliced chicken on top of hot buttery egg noodles…..you can leave out the butter part, but I prefer egg noodles with butter……ladle on the mushroom marsala sauce and sprinkle with fresh chopped parsley. 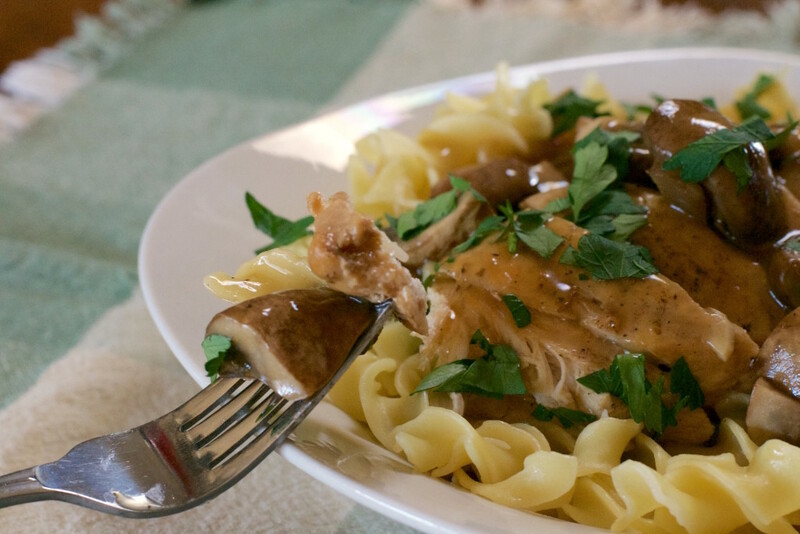 Pressure Cooker Chicken Marsala……….simple, delicious, and quick!! Spray chicken with non stick spray ( I use coconut oil spray)and season with salt and pepper. Using the sear function on your pressure cooker, sear chicken breast. 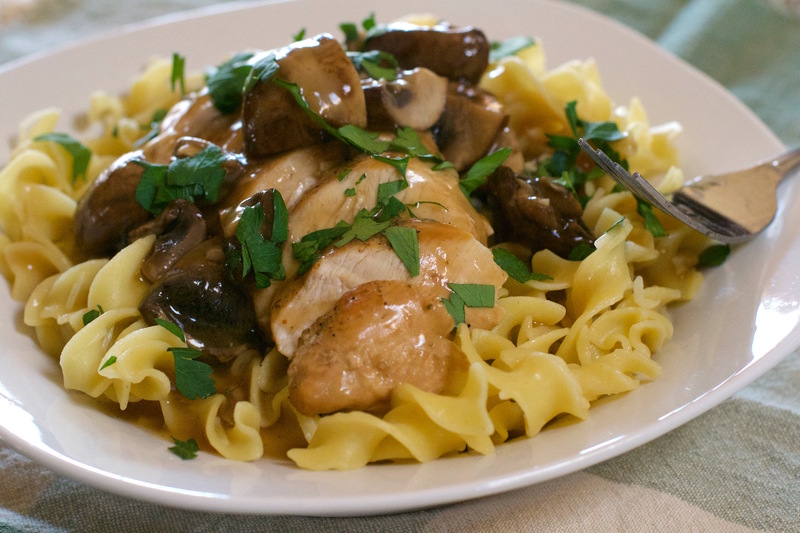 Top chicken with garlic, mushrooms, and marsala wine. Set pressure cooker to high pressure for 7 minutes. Once time is up release pressure. Transfer chicken pieces to a plate. Return pressure cooker to sear feature. Bring mixture to a boil. Whisk together chicken stock and cornstarch until dissolved, then pour into boiling mixture and stir until thickened. Add chicken back and cook another couple of minutes. Adjust seasoning. Place egg noodles in serving dish top with a chicken breast, sliced on the diagonal, and ladle on the sauce. This can also be made in a crockpot. Ajust cooking times. This chicken dish is simply incredible! Added in some onions plus potatoes and it was fantastic! Thank you Reese I’m glad you enjoyed it. Can I make this ahead? I like to make ahead and freeze meals so I can toss it in the Instapot and have dinner done quickly. What adjustments would have to be made if this was frozen? Did you slice the chicken before ir after cooking? Recipe doesn’t indicate natural or instant pressure release. Insplit the difference , let sit 7 min and then vented. Chicken is tough. Any suggestions. I use instant release, if you let the pressurer naturally go down the product, in this case the chicken contiunes to cook, and over cooked chicken is tough. Also I cooked the breasts whole and cut them after cooking. I hope you will try it again. Excellent, made to exact recipe but found the corn starch-chick broth too much. Added 1/2 c chick broth to dilute. Will def make again but will adjust sauce. How much chicken do you cook by weight? Breasts come in so many sizes! Cathy….I must asmit I do not remember the exact weight, but boneless skinless chicken is usually about 1 1/2 lbs per package. Hope this helps. Hi Marty, I just made this for dinner. It’s delicious. It will go down as another one of our favorites from you. The only thing I did different was to add onions, more mushrooms and whole garlic cloves. Thanks for the recipe. I also love instant pot. It goes camping with us. Thanks Grace I’m so glad you enjoyed it. This recipe looks delicious. However, I need to make it for 7 adults this weekend. I’d planned on using 7 chicken breasts and probably double the vegetables. I’m unsure of how much Marsala and chicken stock to use and how much longer it needs to cook under pressure. What would you suggest? I’m making this with 2 friends who have instant pots and are afraid to use them. I’m supposed to help them get over their fears so I really need some advice on this. Marian, if your friends bring theirs pots with you could cook in two separate pots, but if you want to cook in all in the same pot as long as you do not go go over the max line on your cooker you should be ok. You should not have to adjust the cooking time. According to everything I have read pressure cookers cook all the food equally no matter how many pieces are in the pot. With the liquid since the recipe is only a cup and a half total and its the basis for the sauce you should double it. Great flavor. Will leave cornstarch out next time as it made it too thick! First instant pot recipe and was very impressed with the chicken! Did 6 minutes on high pressure with a quick release. Glad you liked it Tarah……..Instant pots are wonderful! !